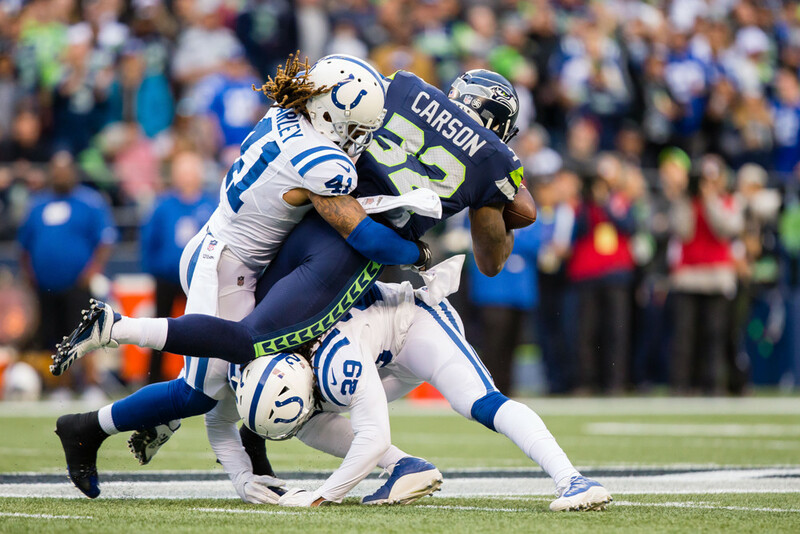 Seattle Seahawks' running back Chris Carson looked like the answer to Seattle's poor run game in the summer of 2017. He was being praised as the best runner in camp, and had opportunity as early as the first game to show what he could do. That may come as a surprise, since he was selected by the Seahawks in the 7th round, five picks from the end, of the 2017 NFL draft. Yet Carson showed something that the Seahawks liked. Unfortunately due to a broken leg in Week 4, Carson's 2017 season was cut short. He ended with 49 attempts for 208 yards (4.2 ypc) on the ground, and caught seven of eight targets for 59 yards and one touchdown. Carson went undrafted in most fantasy leagues before the 2017 season. Carson is currently being drafted at the beginning of the eleventh round (11.01) in 12 team PPR drafts. He is the 47th running back off the board. His draft position over the past month has been slowly climbing, going from mid-12th round to early 11th. As training camp looms, we will get a better picture of who will be starting in Seattle. Although for now it seems like Carson has been written off by most fantasy owners. If you follow fantasy or the NFL nearly as much as we do here at Fantasy Football Calculator, you probably have heard about the hype of rookie running back Rashaad Penny. Penny was drafted in the first round by the Seahawks, and was touted as one of the best backs in the class. This is probably the reason why Penny is going around 4.05 in 12 team PPR drafts (20th overall running back). Most mock drafters are considering Penny as the starter in Seattle, but news has come out in OTAs that Carson actually looks like the best runner thus far. When asked about Carson, Seahawk's beat writer Bob Condotta said, Now healthy, Carson appeared the clear number one ending minicamp and if he stays healthy through training camp, I'd imagine he'll be the starter going into the season. It seems as though Penny isn't a shoo-in for the starting spot after all. Carson is currently a late round sleeper, being drafted in the 11th round. His counterpart Penny is going at a much steeper price, and isn't even guaranteed the starting position. Carson looked great in camp last summer, looked great in the four games he played, and is still continuing to look great in camp this summer. 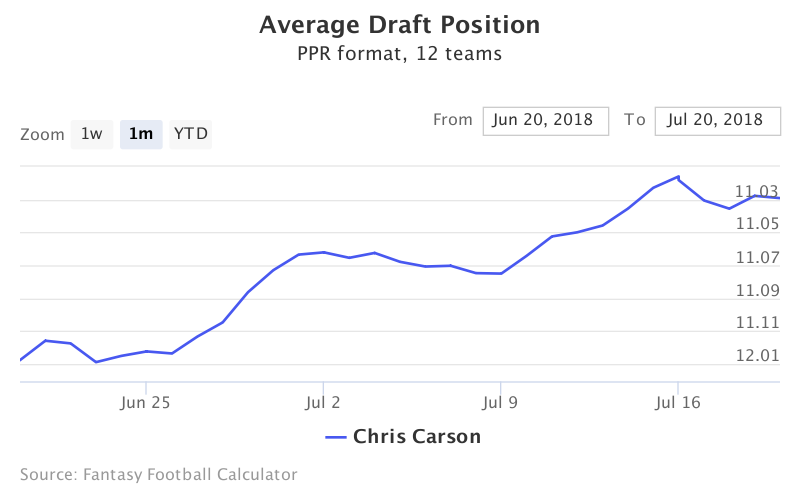 Carson will probably continue to climb up the draft boards, especially if he is named the starter in pre-season. That being said, if you draft early, try and grab this potential late round star.